After an hour and a half trek, we were able to see some other pilgrims who are making their way up and we joined them. Half the way is just a wild path while the other half has steps. 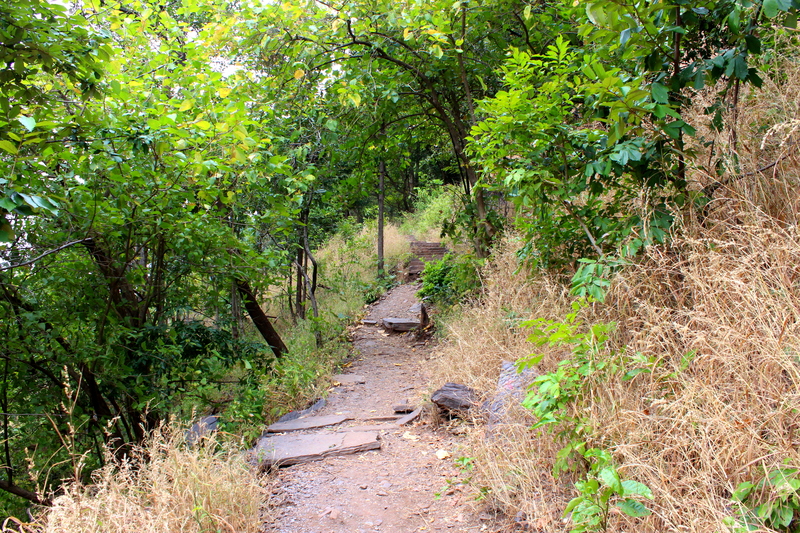 We started ascending the steps which are steep and draining the energy out of us. Half way through, Bilal was down, he told me to carry on as he can’t make it anymore. I told him to wait till I return and continued to ascend. It was here when I got to see few people trying to scale a steep hill. I heard from the devotees that there is the Ugra-Stambha up. 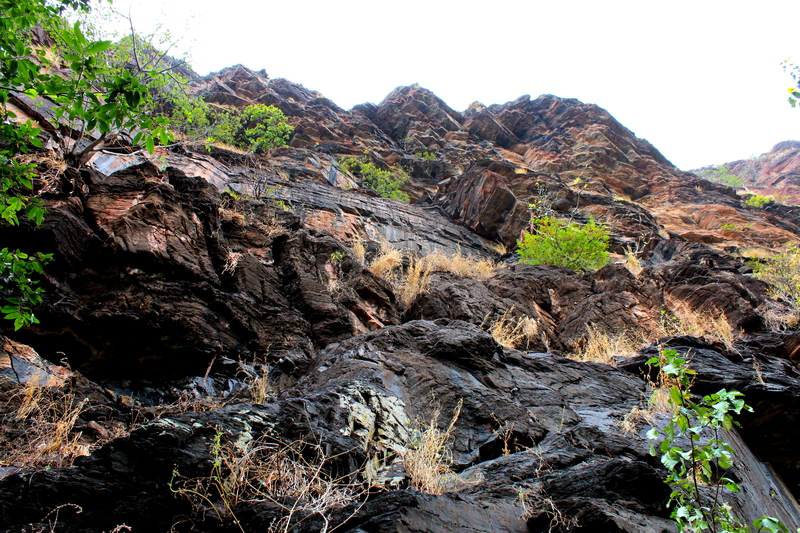 It is a steep hill to climb and full of rocks. Though I wanted to ascend it, I don’t know how much would it take to reach the place and come back and adding to that it started to rain! 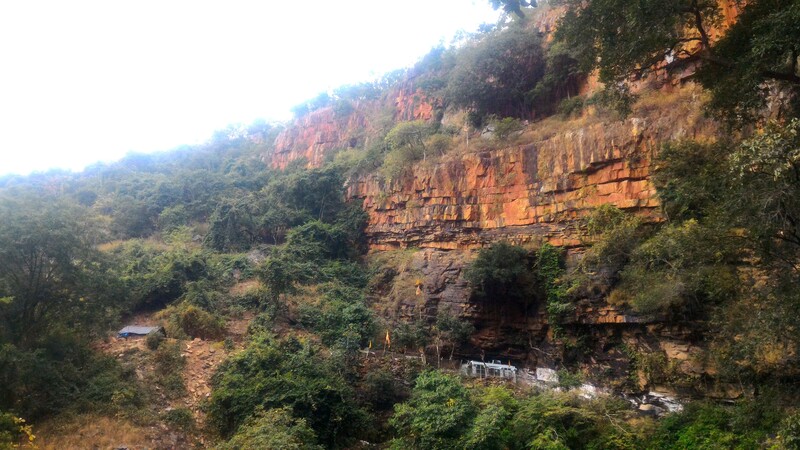 The hill which I was ascending is called the ‘Achalachaya Meru’ where the Jwaala Narasimha Swami temple is located. I need to speed up as we have to return back to Anantapur by evening, so that we can make our return journeys. So I dropped the plan of visiting the Ugra Stambha 😦 . From here, I got the first glimpse of the Jwaala Narasimha Swami temple. After ascending the steps, it was again a rugged path and the path leading to this temple goes under an overhanging rock. 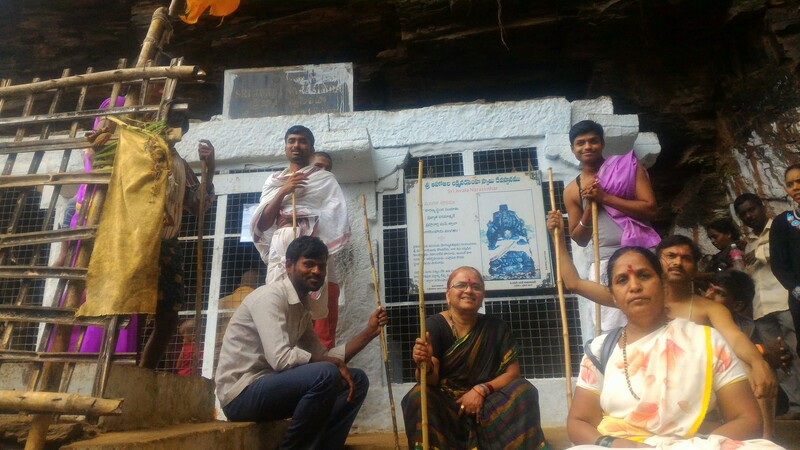 At the same time, a waterfall runs down from somewhere above this rock and one should walk under this waterfall to reach the temple. I saw few devotees filling up their water-bottles with this water and the feeling of walking under the waterfall with the water splashing on you after a tiring trek is truly refreshing and rejuvenating! While I was nearing the temple, towards the right of the path is a small pond called Rakta Kundam. The legend behind this is that Lord Narasimha had washed the blood off his hands after killing Hiranyakashipu. The pond has a red shade and hence the name I suppose. I proceeded into the temple which is again located in a small cave like that of the other temples here and it has some 3-4 idols. The main idol is that of Shri Narasimha Swami holding Hiranyakashipu on his lap and ripping him apart. 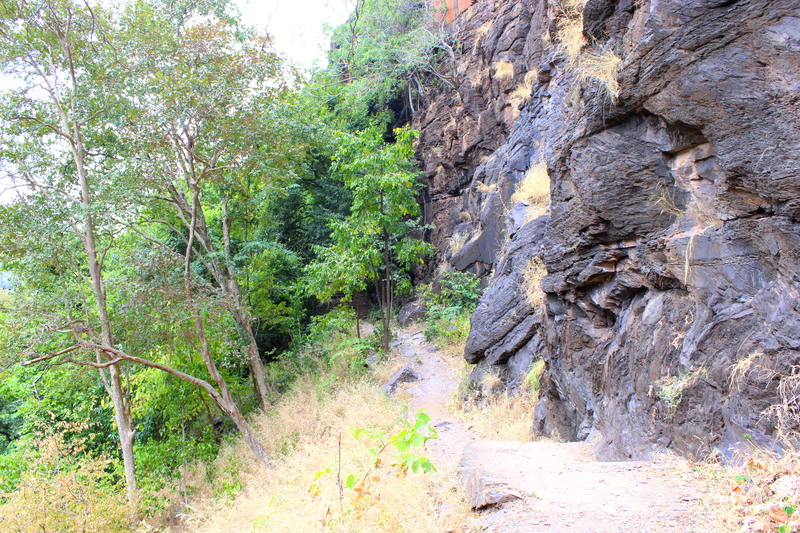 It is believed that this the exact spot where Lord Narasimha had killed the demon king Hiranyakashipu. After having the darshan, I joined Bilal and we started descending down the hill. The up-hill road is narrow and curvy and it took us around 30 mins to reach the Lions Point. We started walking toward the cliff and the beauty in front of us is beyond description. This point gives us a panoramic view of the entire valley and hills and a few waterfalls. Though this time or season is not the right time to visit this place, I will leave the beauty of this place during monsoons to one’s own imagination. 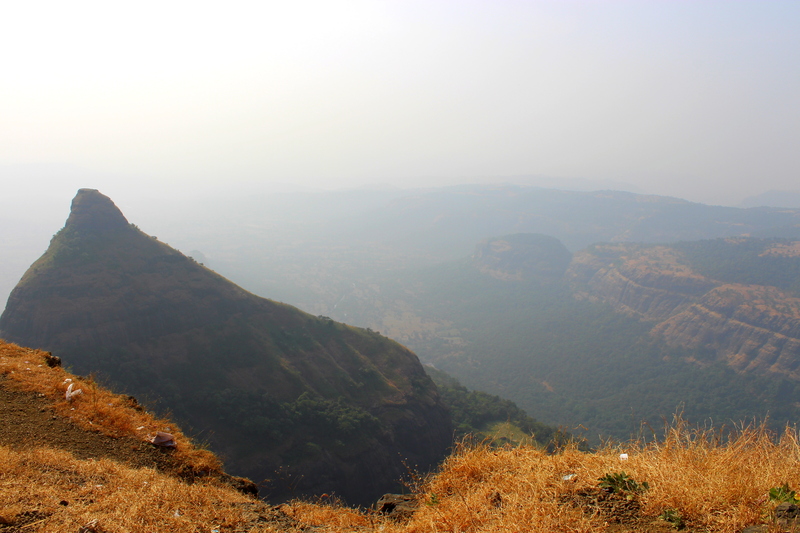 Well-known for it’s weather, Lonavala is really an ideal place to break free all our worries and fall in love with the nature. We have gone around the area and looked around the area on the other side of the road too! It too gives some fantastic views. Our next stop is the Bushi Dam that was mentioned by my cousin to us earlier. One has to walk for 10 minutes in order to reach the dam. It was almost dry except for the water in the reservoir. 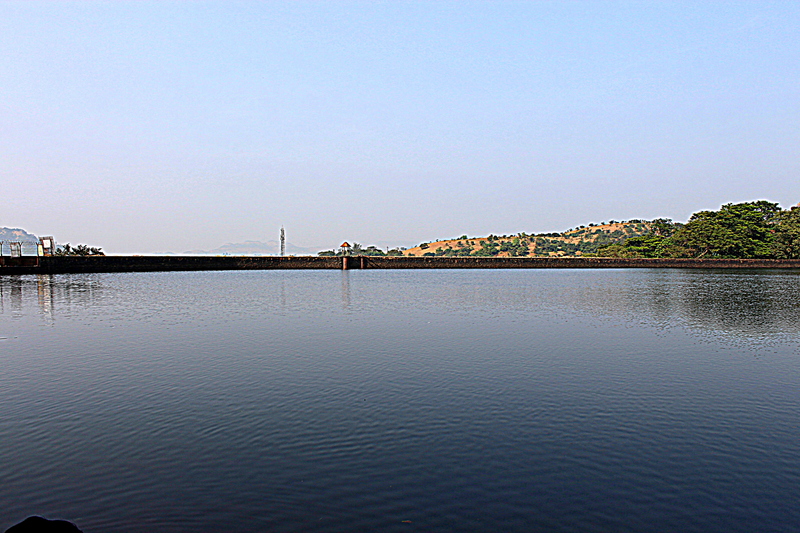 Another 3 min walk from the dam would take you to the reservoir where one can sit with their feet being washed with the cool waters. This would be definitely a hot-spot during the monsoons as the water gushes down and the place is ideal to play as it’s not too steep or dangerous. And I heard many of my Mumbai friends saying that they love to throng at Bhushi dam, where water runs over the steps of the dam, creating a beautiful waterfall. Lachung – the Zumsa governed!! Hurrah! It’s a sunny day again. The day started with more like a poll. 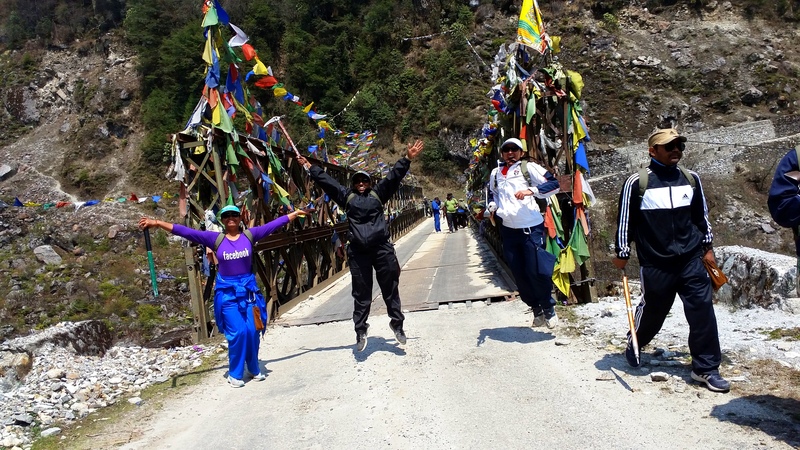 The poll was about whether we would like to trek to Yumthang on the same day or the next. As we hail from a democratic country, everyone has their own right to say what they feel and ultimately there will be a hung, the same happened there too. Half of us wanted to trek on the same day, while the other half wanted to do it the next. 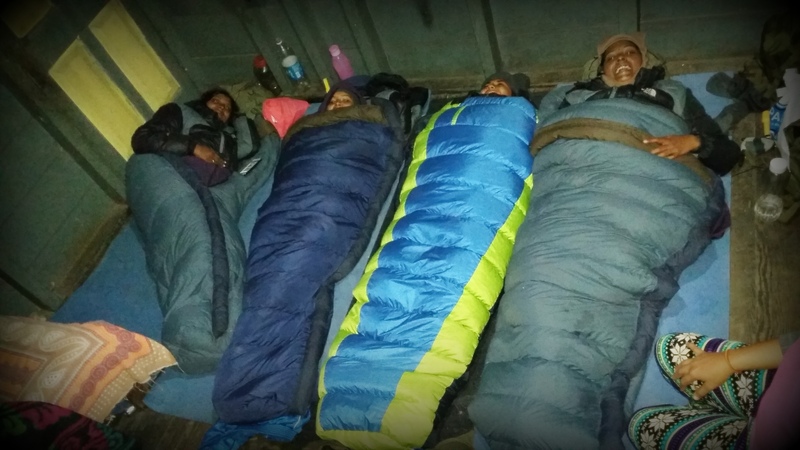 The deadlock got resolved with the intervention of our instructors and it was decided to continue the trek the next day. And what we gonna do all the day? Well, we’re going on a hike, not a long one though. We quickly finished off the puri sabji that has been served to us and got ready to go on a walk around the beautiful mountain village Lachung. Lachung, situated at an altitude of 9000 ft is about 115 kms from Gangtok and is the last village in North Sikkim before Yumthang. The village, spread out on either side of the river Lachung Chu, is surrounded by mighty mountains of which some are covered with snow and some not. And the beautiful waterfalls on almost all the mountains add to the charm of this little village. There are lots of hotels and lodges in this village; I think there is a 3-star hotel too. 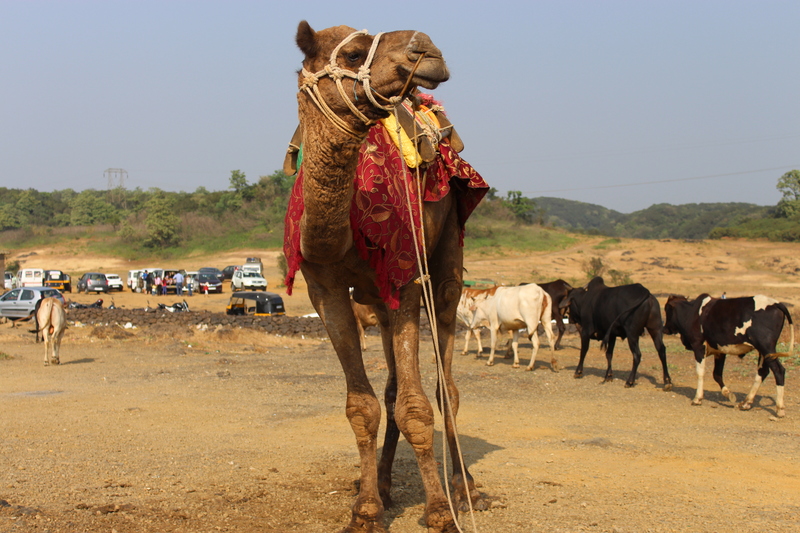 So accommodation is not a problem here and hence became an important tourist spot. There are small shops all along the roads; which sells all kinds of eateries and liquor, which the state is so famous for ;). 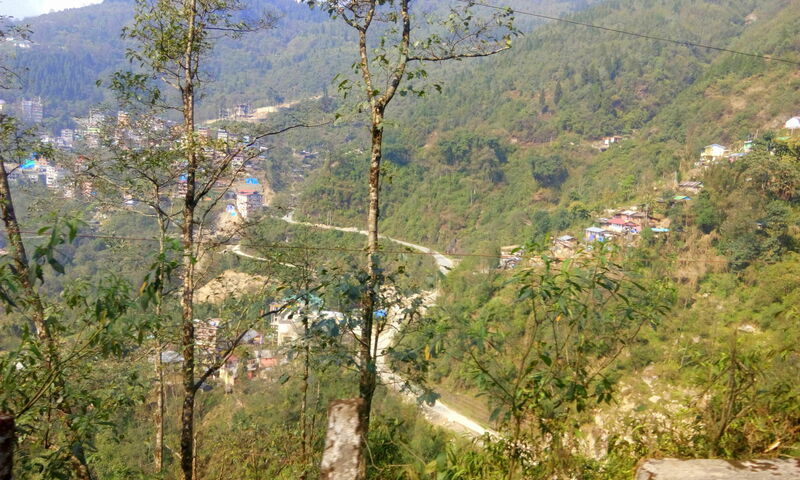 We followed a road just beside the helipad located in Lachung. The narrow road bifurcates just after crossing the helipad. 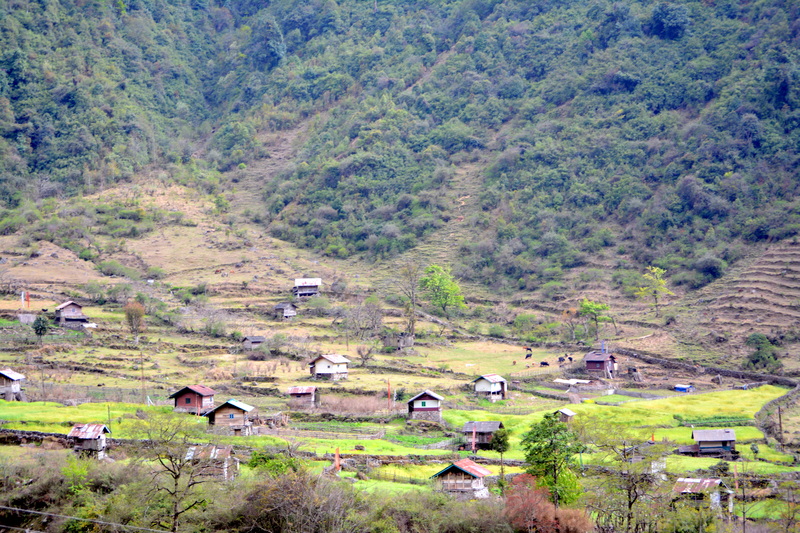 While the left one leads to Yumthang, the right one leads to the remote parts of this village. We took the right one, and this is one of the best so far. One can see that the nature is so beautiful as well as feel the wrath of it. Probably this is one the biggest marks of an Avalanche I have seen so far. Perhaps after 5 or 6 kms of walk, we reached a small monastery, sorry for not remembering it’s name (something like Chhuwa). It was so simple, yet very beautiful.. so peaceful with the positive vibes spreading throughout its premises. To my surprise, there was no one in the monastery as well as the premises. The sanctum was on an elevated platform and there were no lights inside except for some flickering butter lamps. I could see a statue of Buddha along with some statues of others, probably of Guru Padmasambava. We were back by 2 pm and went on to a small walk to the helipad in the evening. It was rightly said that the weather is so unpredictable here. The day was so sunny, but by 4 pm the temperatures dropped so drastically and in a while it started to drizzle. We returned to our rooms and started the fun part of dancing and singing, as well as packing for the next days’ as it is going to be tougher. Wait.. Wait.. Many of you might be thinking that I left something unsaid. The title of the post, right? Well, that is the most important feature of this little beautiful village. Lachung has a unique local and traditional self-government body called the Zumsa, a part of their rich tradition and culture. The Zumsa takes care of all the local disputes and are settled by a totally representative body of the village which is headed by an elected Pipon. The best is yet to come! Stay tuned!!! Time to move on! Lachung is waiting!! It was a sunny day and the weather was clear. We packed our rucksacks and left for breakfast. 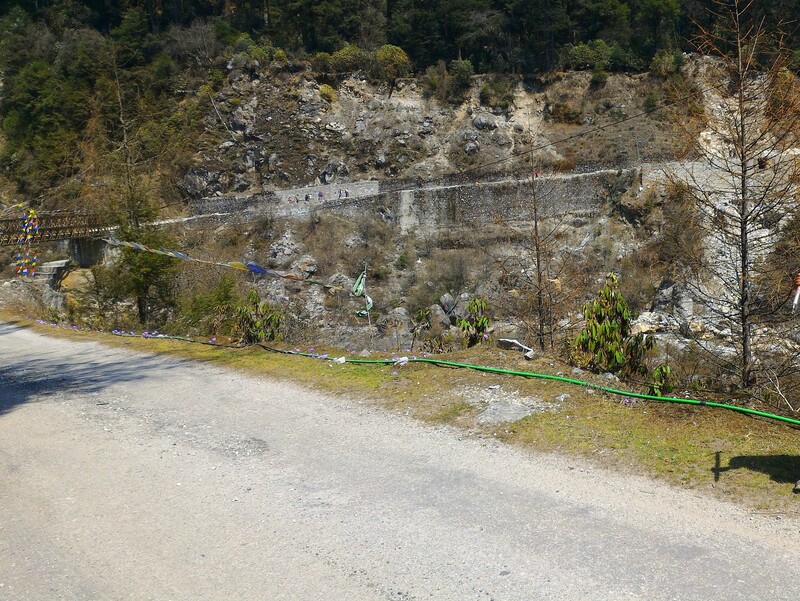 Before moving on, we quickly cleaned up the surroundings and set on to the track for Lachung, our next base camp at around 7.30 AM. Lachung is a small mountain village located at an altitude of 8600 ft and a distance of about 110 kms from Gangtok and 25 kms from Chungthang. And we gonna trek this 25 kms in a single day. Though excited, we were a bit scared too. Scared not because of the distance, but coz of the off-road route which we gonna follow! 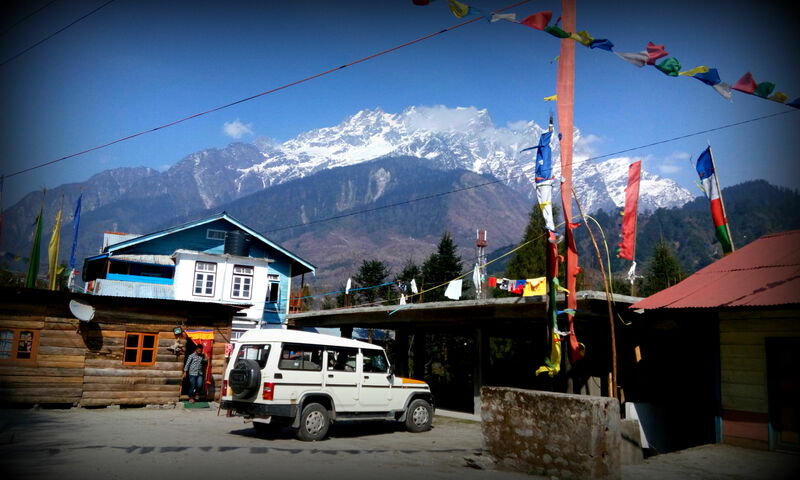 The way to Lachung is through quaint villages, scenic spots, and waterfalls. The first leg is of 12 or 13 kms. It’s almost a road trek except for one or two shortcuts. We stopped at a roadside tea spot around 10 AM where we got some buns and tea as refreshments. 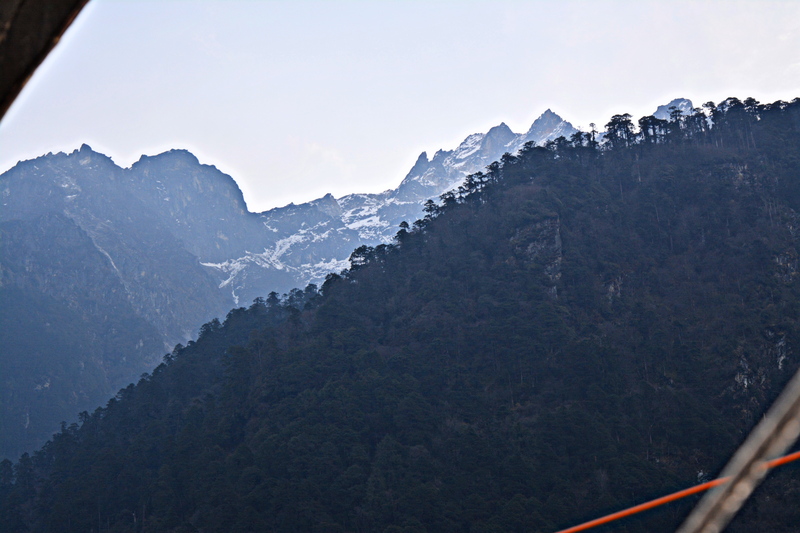 After relaxing for a short span of 20 minutes, we resumed our trek towards Lachung. They told us that the next leg is of another 12 kms but it’s only at the end of the trek we realized that it is nearly 16 kms. 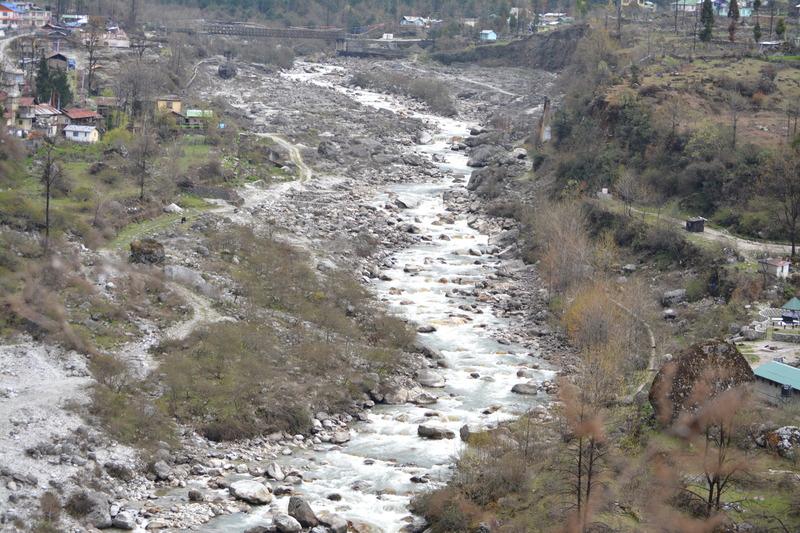 The second leg is far more beautiful than the first leg, as there were lots of streams which cut right through the roads, some lush green agri fields probably of some millets or fodder, yaks, Rhododendrons, waterfalls and the beautiful Teesta River running all way along with us. 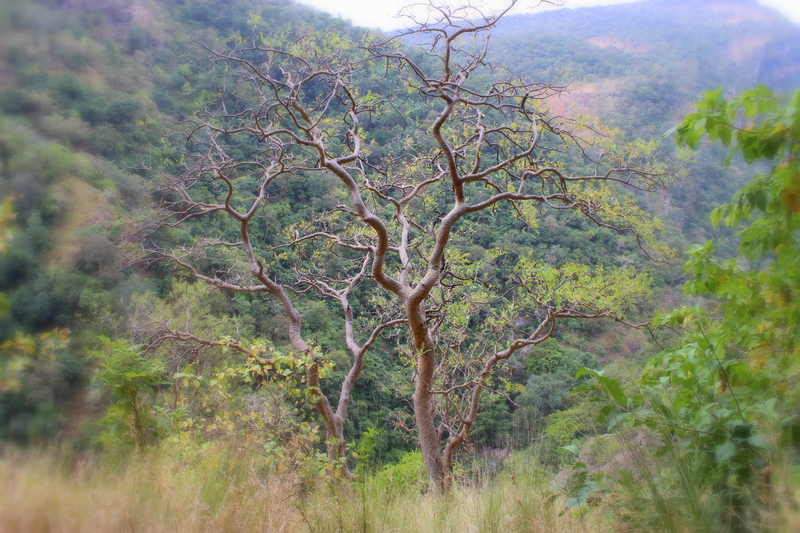 I thoroughly enjoyed this part of the trek as the short hikes through the forests were spine chilling, because of the narrow margins and rough terrain. We could see more and more number of army people and their vehicles as were nearing Lachung. Before 1950, Lachung served as a trade point between Sikkim and Tibet and after the Chinese annexation, this has been shut down. The Indian Army now has a forward base at Lachung. 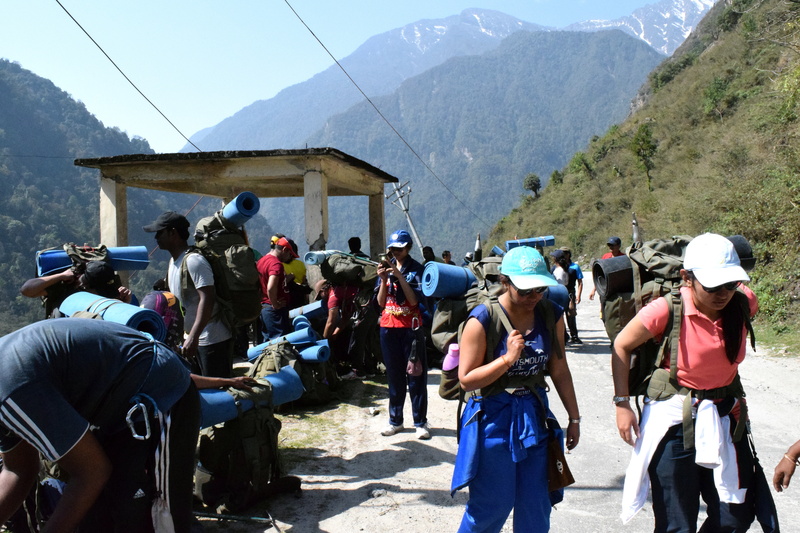 Finally at around 3.30 PM we reached our base camp at Lachung. A hot meal was served to us and it felt so good to have something hot after a long trek. We had lots of fun before having our dinner and retiring to our beds. Lucky enough to get a bed to sleep, but not in the sleeping bag 😀 . Stay tuned to see what’s waiting for us in Lachung!! The landforms are a result of two processes. The first, or the internal process leads to the upliftment and sinking of the earth’s surface at several places. The second, or the external process is the continuous wearing down and rebuilding of the land surface. The wearing away of the earth’s surface is called erosion. The surface is being lowered by the process of erosion and rebuilt by the process of deposition. The different landforms can be broadly grouped as mountains, plateaus and plains depending on elevation and slope. A hill is a land surface that rises higher than the surrounding area. Generally, a steep hill with an elevation of more than 600 meters is termed as a mountain. A mountain is any natural elevation of the earth surface. The mountains may have a small summit and a broad base. The range is a line of mountains. In some mountains, there are permanently frozen rivers of ice. They are called glaciers. Examples are the Himalayan mountain ranges of Asia, the Alps of Europe and the Andes of South America. The various types of mountains are fold mountains, block mountains and Volcanic mountains. The Block mountains are created when large areas are broken and displace vertically. The uplifted blocks are called Horsts and the lowered blocks are called Graben. The Volcanic mountains are formed due to the volcanic activity. A Plateau is an elevated flat land. It is a flat topped table land standing above the surrounding area. 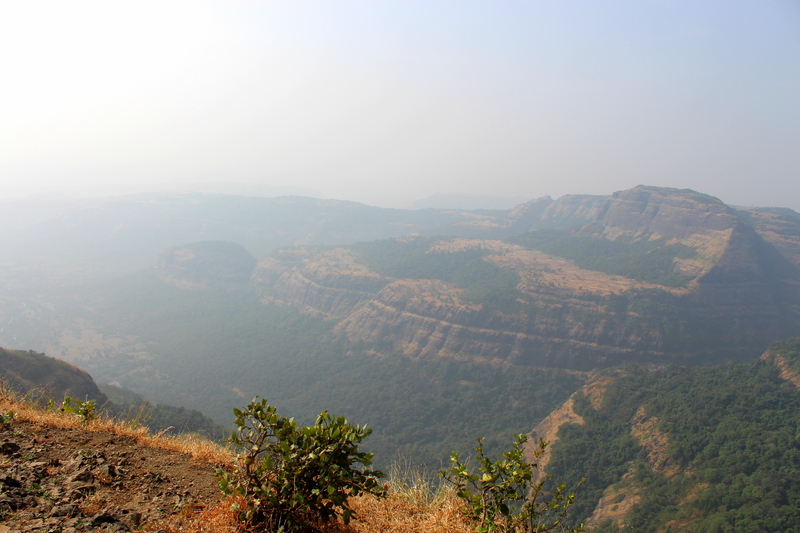 Example: Deccan Plateau of India. Tibet Plateau is the highest plateau in the world with a height of 4,000 to 6,000 mts above the mean sea level. And they are rich in minerals. 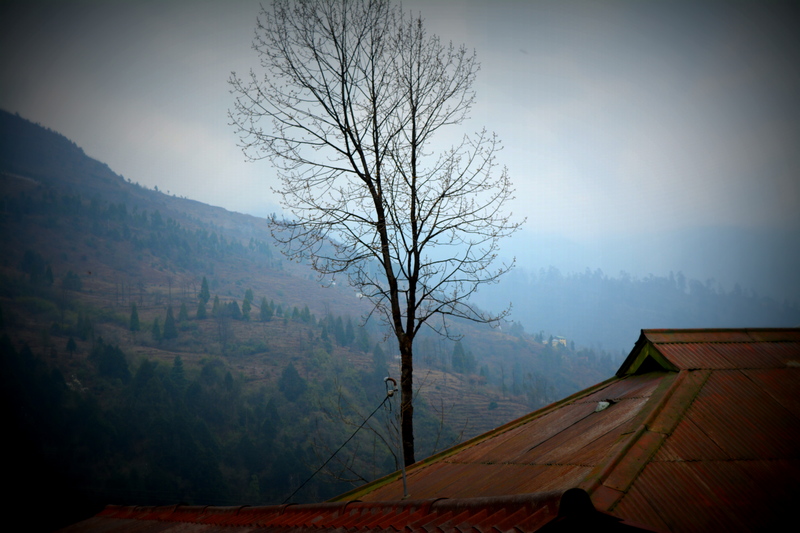 Example: Chotanagpur plateau of India. Generally the Plateaus are not continuous and are broken and hence there could be lot of waterfalls seen over plateaus. Example: Jog falls in Karnataka. These are large stretches of flat land and usually they are not greater than 200 mts above the mean sea level. Most of the plains are formed by the eroded materials bring forth by the rivers. And hence they are very fertile. Example: Yangtze plains in China. Construction of transport network is very easy and thus these plains are the very highly populated areas of the world.